Oils and fats are generally known as lipids. These lipids are the most important nutrients of human and animal diets. Lipids are the most concentrated energy source of any foodstuff, supply vital fatty acids, serves as a carrier for soluble vitamins and makes food more palatable. Oils are categorised according to the composition of fatty acids. The most common fatty acids found in oils are listed in the table below and are divided into three categories, i.e. 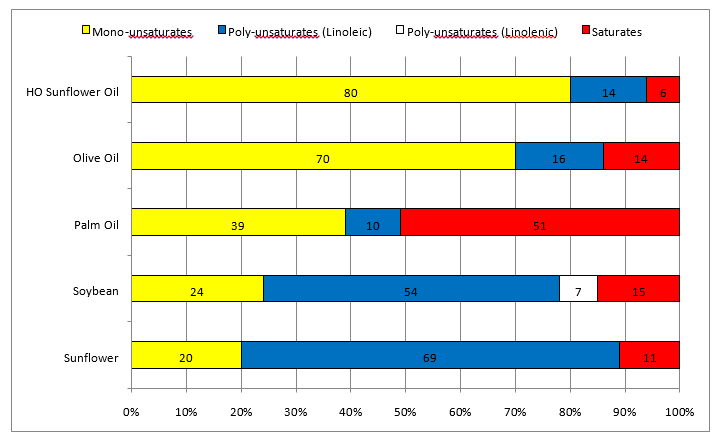 polyunsaturated, monounsaturated and saturated components. The predominance of certain fatty acids will vary within species of plants according to cultivar and environmental influences. The predominance of certain fatty acids is then the main reason why all oils are not the same. Oils high in polyunsaturated components will for example not last as long as oils high in monounsaturated and saturated component as polyunsaturated components tend to oxidise more rapidly. Saturates are mostly solid at room temperature. Some oils high in saturates therefore tend to become semi-solid in lower temperatures as is the case in winter months. This problem is often addressed by additives, processing or blending. Polyunsaturated, monounsaturated and saturated component are however all important components used by the human body for a variety of functions. The abundance of certain fatty acids can however be detrimental to the general health of the human body. Diets high in saturated components are mostly associated with a higher risk of coronary heart diseases. The relation between these components will therefore influence the classification of what is generally referred to as healthy or harmful oils. With the international awareness of health, healthy lifestyles and disease prevention, one of the factors that are well researches and well known, is the advantage gained from healthy eating habits. The well known Mediterranean diet based on the use of oils high in monounsaturated fat (as typically found in High Oleic Sunflower Oil and olive oil), has made people aware of the advantages of oils high in monounsaturated fat. This monounsaturated fat is commonly known as Oleic Acid or Omega 9. Researchers have found that a diet containing these oils reduces the risk of heart disease by lowering the levels of LDL (Low Density Lipoprotein) cholesterol. When referring to healthy oils it is important to remember that all oils has 9 calories per gram. It is therefore important to limit the intake of fats and oils as part of a healthy eating plan. The general guideline is that fats and oils should be limited to between 25% and 35% of total calories per day. This translates to between 50 and 70 grams per day. When choosing oils, it is important to remember that both saturated and unsaturated components of oil are required by the human body. Saturates should however be limited to less than 7% therefore unsaturated components should make up the other 93%. Cold Pressed Vergezocht High Oleic Virgin Sunflower Oil it therefore the ideal oil as saturates represents only 6% of total fat. The advantage of unsaturated components (monounsaturated and polyunsaturated), if used in place of saturates, is the ability to lower your risk of heart disease and strokes by reducing the total cholesterol and low-density lipoprotein (LDL) cholesterol levels in your blood. Monounsaturated oils are typically high in vitamin E, an antioxidant vitamin. The process applied to extract the oil from the seed or plant also plays a role in how healthy it is. Extraction is done using a mechanical and/or chemical process. The most common and cost efficient method of extraction is chemical extraction, also called solvent extraction. Solvent extraction utilises high heat and a series of chemical processes, primarily hexane gas, to remove and refine the oil. In mechanical extraction, called cold pressed or expeller pressed, oil is squeezed from the source, usually with hydraulic presses. This minimal exposure to heat preserves the natural flavor and quality of the oil but limits the yield, making mechanically extracted oils more expensive than chemically extracted oils. 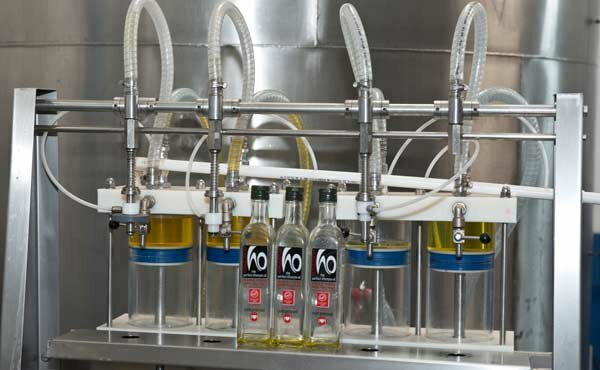 Cold Pressed Vergezocht High Oleic Virgin Sunflower Oil is produced using mechanical extraction. This is evident in the rich golden color of the oil as well as the distinctive “nutty” flavor and aroma. Heat has a severe impact on the quality and nutritional value of oils. There has been a common misconception that all oil is suitable for cooking. Each oil has a unique smoke point. This is a good guideline for the selection of an oil. Good all purpose cooking oils are those that can stand high temperatures. High heat oilsare used for searing and frying, medium-high heat oils for baking, sautéing and stir frying and medium heat oils for sauces, low-heat bakingand pressure cooking. Cold Pressed Vergezocht High Oleic Virgin Sunflower Oil with a smoking point of ± 238ºC is therefore an ideal all purpose oil. Oils high in omega-3 essential fatty acids should be protected from heat.